Pub Night chum Corey Blodgett is moving on from the McMenamins Cornelius Pass Roadhouse, where he built quite a following for his seasonal and special brews. Since his fiancée Anastasia got a good job in Bend, he's moving out there. 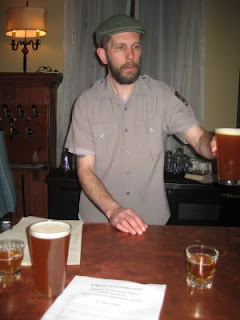 He's hired on as the summer-season brewer at McMenamins' St. Francis School. Wednesday was Corey's final Last Wednesday beer tasting at the CPR, so we had to make the trek out there to help drain some special kegs and send Corey off with a bang. It takes a lot to get me out of my comfortable Southeast Portland beer cocoon, but thankfully Dave was man enough to drive Lindsey and me out there. It's in Scott's neck of the woods, so he met us there also. The Beatnik Saint was the star of the evening. The picture shows Corey handing out a glass of that. It's a beautiful, hearty ale made partly with wheat, just slightly tart with a tiny bit of esthery flavor. The aged Sasquatch was interesting. Corey thinks the barrel might have had some wild yeasties living in it, because it got a little sour in the barrel. It wasn't as good as the pure Sasquatch that he brought to the Green Dragon a few weeks ago, but it was interesting enough for me to bring a small growler home. The huge malty flavor of the beer was enough to balance a little sourness and a little whiskey. Rose City is always a fine choice, and Evolution is a pleasant session beer. But the real session beer champion Wednesday was the Mild. It was a fabulously flavorful dark mild, coming out of the firkin almost completely flat. If I had a firkin of that at home, I'd give up on water, especially seeing as how the grains were all organically grown. Even with the low alcohol, it didn't seem thin, and even tingled a little on the tongue. My pint was almost gone before I'd even paid for it. Try a taste of Corey's Zen Lunatic at Cheers for Belgian Beers today and tomorrow. All I can say is, our loss is Bend's gain. Auld lang syne, Corey! We'll take a cup of kindness yet. wish I could have made it but I dont have a car to leave our SE portland confines. Hope to make it down to Bend this summer and say hi though. Best of luck to Corey, sorry we missed it. Should be some fine real estate deals in Bend! Good luck. I'll be sad not to see Corey when we show up out there next month.